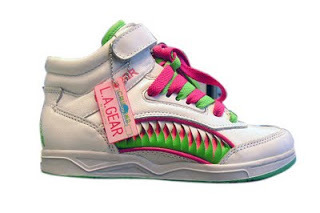 L.A. Gear was the only sneaker brand that mattered. I mean, just look at that marvel in design and color. How could it not?! Once upon a time, sneakers were just that, sneakers. They were no more a fashion statement to children than underwear: necessary but invisible. They didn’t come with icons or endorsements or devices that lit up or blew up. They were meant to be comfortable and practical things that were wore during gym class and playtime. They were also pretty ugly, not pretty pretty. And that’s what I lived for as a kid, the pretty pretty. In a girls’ size 4 please, cause I gotta rock these with my She-Ra dress! For about a decade during my adolescence, I could have cared less what sneakers were on my feet. For a time, in fact, they were my least favorite shoe…ever. I hated going shopping for them. Even when I became old enough to pick out my own, I didn’t like them. I wanted the pretty shoes, the ones with the straps and the heels and the pointy toes. I rarely won when it came to convincing my Mom that I needed sparkly shoes in my life, because I apparently needed sneakers more. But then, high school appeared on the horizon, and everything changed. The summer before I started my freshman year in high school was a strange one, a nervous one, and one during which I became obsessed with compiling outfits. Not just obtaining items of clothing themselves, but creating complete looks – from hair accessories to shoes – in which I felt confident. When the time came to go school shopping, I knew exactly what I needed. From big sweaters to the “perfect” pair of acid-washed jeans to, you guessed it…sneakers. If I had to wear sneakers, I was going to make them count too. Who knew my salvation would come from J. C. Penney?! Hello Penneys. It’s been a looooong time. Yes, but without all the frou-frou…yet. Once I got the sneakers home, the wardrobe planning commenced. While I had finally obtained a couple pairs of the cute, pointy-toed shoes that I had always wanted, I got much more mileage out of the sneakers generally. They pretty much went with just about any outfit I came up with. I was numbly excited to get the school year going just so I could roll around in my new kicks, complete with pegged jeans, of course. And then freshman year went off without a hitch. ::stifles laugh:: In my dreams! I was a freshman in high school – cool sneakers didn’t make the entire experience any less horrible and awkward. Despite the torments of high school, I became an all out L. A. Gear whore. Seriously. It was the only sneaker brand I wore for nearly four years. I mean, their range of colors and styles only grew during that time, and they were so versatile! One of the best things was that they ran slightly large, so they were perfect match for big, puffy slouch socks (one or two pairs!). They were also great when it came to creative lacing. You remember those extra-wide laces? Or the long, ribbony ones? Any lace of any variety just worked in those sneakers. I remember weaving together laces of different colors (though they had to match whatever colors were on the sneakers), in a variety of ways – from a simple checkerboard to unique, complex designs that neither I nor anyone could replicate. Back then, we didn’t need a goddamn chart! We had our IMAGINATIONS! As with most trends, they eventually fade. L. A. Gear’s fifteen minutes of fame had dimmed some by the time I was a senior. Oh, I still had L. A. Gears, but they were mainly used for gym class or trolling around the house. The last pair of L. A. Gears that I remember buying was rather plain in all white – nothing special, just necessary. Buying them was a more an “I know they fit” choice rather than a fashion choice. With the reintroduction of platforms shoes and all things 70s around that time, my interest in footwear veered back towards the strapped, well-heeled, and pretty pretty variety. Having a pair of traditional sneakers just wasn’t as necessary, and I soon traded up (Down? Sideways?) for a pair of old-fashioned Chuck Taylors, because cool was cool, y’know? And L. A. Gears became…just…not so cool anymore. The classics are usually the coolest. All L. A. Gear sneakers came with a plastic tag emblazoned with its logo. I kept one of the several that I had collected on my key chain for several years. Being cheap plastic on a cheap chain, it didn’t last very long. The sneakers themselves fared much better in that regard. Shoe shopping is my lest favorite kind of shopping to do. I meant *Least* not *Lest*. Vowels are important. Yeah, it’s not really my favorite kind of shopping anymore. I hated it as a kid, but then I really liked, and then I went overboard with shoes. Now, I only get them when I really need them.